So is her 6-year-old son, who just finished kindergarten. I’ll let her set up this note. I have a notepad I carry with me to jot ideas on. It’s usually full of half-written blogs, grocery lists, and other to-do items. Dictator, my 6-year-old, got his hands on it and inspiration kicked into high gear. He is a writer in training. 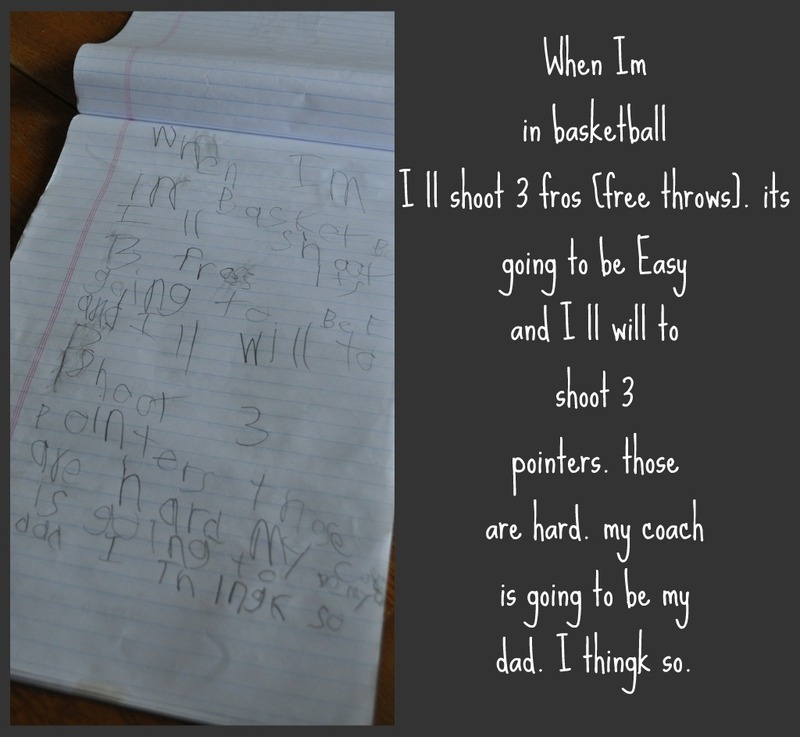 Given that Dictator can already fill two pages of his mom’s notebook and that he knows the difference between a 3-pointer and a 3-fro, I’m betting we have a Renaissance Man on our hands. And the world needs more of those. Visit Annie at her fantastic blog, Six Ring Circus; you won’t be disappointed. You can also follower her on Twitter @Annie6rc. Posted on July 6, 2011, in Miscellaneous, Writing in Weird Places and tagged Annie, Chase McFadden, Ironic Mom, Leanne Shirtliffe, Renaissance Child, Six Ring Circus, Some Species Eat Their Young, StuffKidsWrite, Stuffkidswrite.com. Bookmark the permalink. 18 Comments. That kid. I love him! He’s always got big plans. It’s fun to see his writing “published”. Words from the heart of a child – so sweet! I love how he has big plans. He should have big plans, that one! That’s great, Leanne. 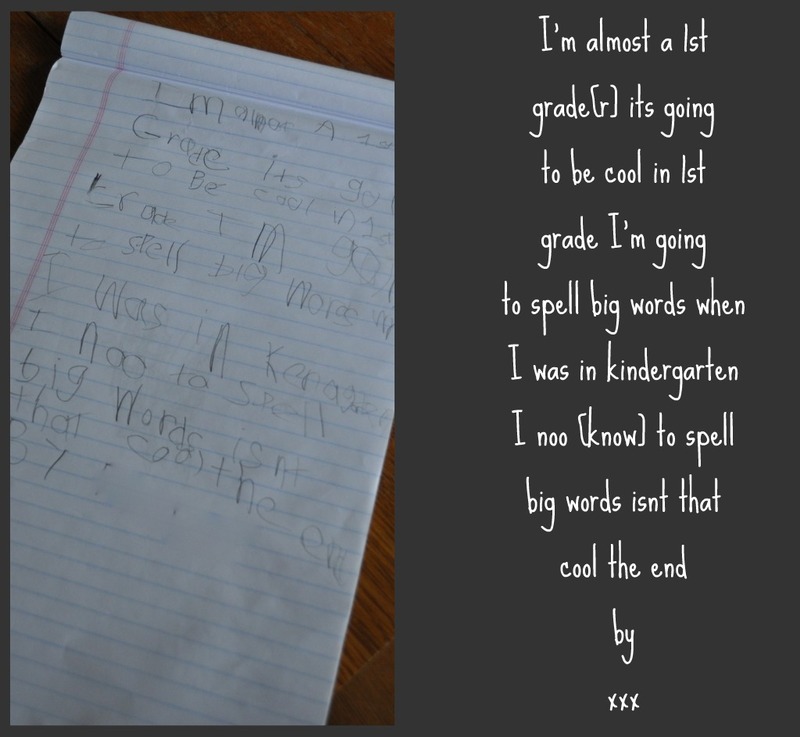 When our daughter was about 4, maybe 5, she started asking me to spell certain words. It turned out she was writing a poem … about a dog that ate a cat inside a bag. It didn’t really make a lot of sense, but it rhymed! Love the rhymes and the experimentation with language. I wish I could take half as many risks with words. Awesome! So his coach is going to be his dad? What’s going to happen to his old dad? Hilarious, Jess. I hadn’t thought of it that way because I knew what he was thinking. 3-fros…love it!!! Too cute. What an awesome keepsake! Hoops and writing: that’s a winning combination. Dictator and I have a lot in common, except I don’t find 3-fros that easy. Awesome, Annie. That needs to go in a frame. Thanks for sharing. I am not sure why he thinks 3-fros are so easy. Makes me think he’s been listening to his 10-yr-old brother talk. It’s one for the memory book. Love this! I remember when I was in elementary school all the guys called them 3-fros too, up til about fourth grade or so (uh, we didn’t have 3-pointers back then). OH, I had forgotten we didn’t have 3-pointers. I suddenly feel so old. Love this blog – you two have the most unique things about kids – love the things they say and do! Thanks, Cindy. Kids really are the natural humorists. I usually make jokes, but this is so sweet, I just can’t. Dictator has the power to still sharp tongues. Now that is magical!